The part of a plant that can make another plant. Botanically, a seed is the matured ovule without accessory parts that is produced by gymnosperm and angiosperm plants which occurs after fertilization and some growth within the mother plant. 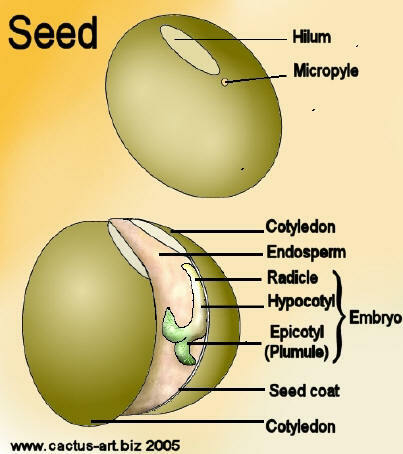 It is a small embryonic plant enclosed in a covering called the seed coat, with or without some stored food (endosperm). Usually a plant makes flowers, then once the flowers have been pollinated, they turn into fruit. The seeds are inside the fruit. Seeds can be spread by wind, water, or animals. Colloquially, a seed is anything which may be sown; i.e., seed potatoes (which are vegetative tubers); seed of corn, sunflower, etc.